Revision Tan 499 Desert Locust Goggle with MULTICAM Sleeve and case w Tan framed goggles! 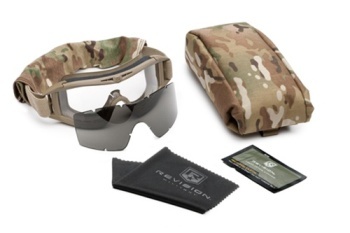 Revision Eyewear Desert Locust Goggle builds upon Revision Eyewear's unmatched ability to protect our soldier's eyes. These goggles combine the best ballistic protection with a perfect facial and helmet fit, balancing the soldier's need for comfort with well-sealed eye protection. The high performance OcuMaxï® coating prevents fogging and scratching to ensure clear vision while optically correct goggle lens is engineered to maximize field-of-view and provide unprecedented visual clarity. Colors of frame is DESERT TAN with MULTICAM sleeve and case. This is a rare item to find. System includes CLEAR lense for Indoor/Night Use, and Smoke lense for Sun protection, a microfiber cleaning cloth, storage case and anti-reflectant sleeve, and a soft durable case that holds the entire system with velcro MOLLE webbing on back for attachment to other gear and easy access. Great low price - $59.95, one unit only, MSRP is $89.95!